With many stalls and activities set up to educate and entertain, indigenous and non-indigenous residents from Midland and the Perth Hills had plenty to do last Tuesday. Despite an overcast sky and a chill in the air, more than 100 adults and children converged on the oval between 10am and 2pm to jump on the bouncy castle, have their face painted, take part in a footy competition, and pick up information about indigenous health and other free services. Rule, who at age 11 had an on-stage encounter with her idol Mariah Carey, performed her own songs, Me Without You and Keep Treating Me. Young girls were picked out of the crowd to help her perform a cover of the Christine Anu hit My Island Home. 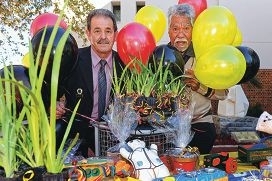 Naidoc Week promotes and celebrates Aboriginal and Torres Strait Islander culture.